The blaze, dubbed the Old Fire, went from 30 percent containment early Sunday morning to 75 percent as of 2:15 p.m. Evacuation orders were lifted Sunday afternoon in the 516-acre Calabasas, California, fire that damaged several structures and forced thousands to flee their homes. 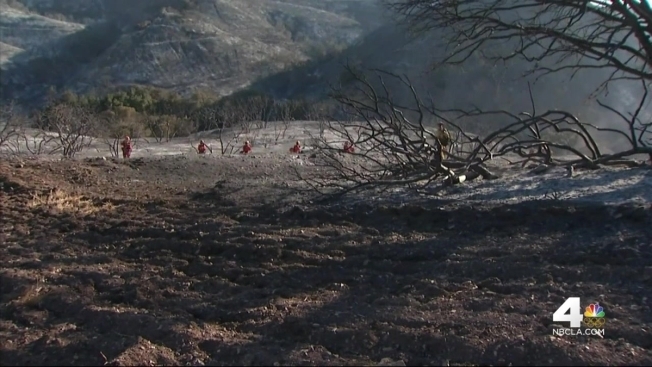 "One day it's there and the next day, it's smoldering like a wasteland," said Calabasas resident Pete Seltzer. Three firefighters were injured during the fight, including two who suffered knee injuries and one who suffered a cardiac event, authorities said. The massive blaze, which ignited just after 4 p.m. Saturday and was dubbed the Old Fire, forced the mandatory evacuations of 5,000 people in the Highlands, Eddingham and Adamsville neighborhoods, and voluntary evacuations in adjacent areas, fire officials said. The fire went from 30 percent containment early Sunday morning to 80 percent as of 5 p.m., according to the Los Angeles County Fire Department. Evacuation orders were lifted at 6 p.m., meaning residents could return home. Blocked-off roads also reopened. Officials initially said two homes sustained minor damage, but later confirmed only one had been damaged by fire retardant. A commercial building was destroyed by the blaze, while four other structures were damaged, according to LA County Fire. The fire sparked after a driver lost control of a sport utility vehicle and crashed into power poles, downing lines in three different places, Captain Keith Mora said. The three fires broke out in the area near the 23000 block of Mulholland Highway and merged into one massive blaze which began edging closer to homes Saturday afternoon. Up to 400 firefighters continued to fight the blaze Sunday morning, which was expected to flare up again. Fire officials said the head of the fire was moving east, towards a steep area of Topanga Canyon and firefighters may have to be airlifted to fight the blaze there. A grateful homeowner delivered muffins to firefighters, thanking them for their tireless work as they ensured hot spots were under control. The large fire came as NBC4 Meteorologist Shanna Mendiola warned of excessive heat warnings across SoCal, along with dry winds. Officials said they feared southwest winds could push the flames to the east Sunday, which could pose a challenge. Residents in the San Fernando Valley and Santa Clarita Valley were advised to avoid any vigorous outdoor activities as a smoke advisory was in effect through midnight. CHP officers had closed Topanga Canyon Boulevard to all traffic between Mulholland Highway and Old Topanga Canyon Road, in the heart of the canyon village. The southern part of the unincorporated Topanga Canyon community was not evacuated, and a roadblock at Pacific Coast Highway prevented all but residents from approaching the village from the Malibu coast. Residents were being evacuated to Agoura High School at 28545 West Driver Avenue. Anyone with large animals was asked to evacuate to Los Angeles Pierce College at 6201 Winnetka Avenue in Woodland Hills. Anyone with small animals should evacuate to the Agoura Animal Care Center at 29525 Agoura Road. The Los Angeles County Fire Department compiled tips on what do if confronted with a fire. Experts advise against stopping to gather your belongings — just get out of the house if mandatory evacuations are ordered. Call the fire department from a neighbor's house. Calabasas is a city of about 24,000 residents in the hills west of the San Fernando Valley and northwest of downtown Los Angeles. It is home to several affluent gated communities and numerous celebrities.